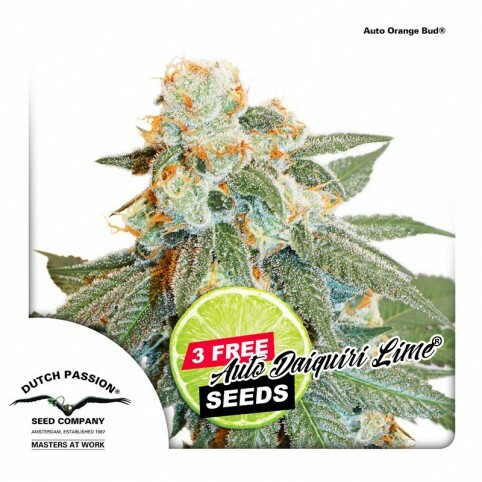 The Dutch Passion master breeder responsible for some of the best modern autoflowering genetics, such as Auto Mazar®, Auto Ultimate®, and Auto Daiquiri Lime®. A male autoflowering Auto Daiquiri Lime individual was first crossed with our supreme original Orange Bud photoperiod mother plant. He waited until he had enough capacity to make a selection from as many plants as possible, so he could breed the best from the best over 12 subsequent generations. The project took over three years, our biggest and most complexed autoflowering breeding program so far. The breeder selectively bred those plants with the highest THC levels, the biggest yields, the authentic Orange Bud smell, taste and effect. The result was an autoflowering variety which is as good as our original photoperiod Orange Bud in potency, quality and aroma/taste. Even our experienced test panel could not notice the difference in a blind test. We are pleased to work together with Jorge Cervantes in our mutual project: "Jorge’s Diamonds". The ..
Upgrade of one of our most appreciated plants, developed from a NYC Diesel line.Extremely potent, th.. Exceptional hybridization of our SWS04 (Cream Caramel®) with our elite clone of AK47. The result of ..
Feminized and non-auto-flowering version of one of the most famous strains from the West Coast of US..
Jock Horror cannabis seeds are a three-way marijuana hybrid of Northern Light, Skunk and Haze. ..
Damnesia cannabis seeds are a new twist on a legendary classic strain, A.M.S.A.M.S was then crossed ..
Kalashnikova is a cross between two classics: AK-47 and White Widow. It gives a strong, long-lasting..
Indica mix G contains strains: A.M.S. The Church, TrainWreck, White Widow, White Rhino..
Deimos Auto-flowering cannabis seeds are a mostly Indica hybrid with her ancestry coming from the le..
A cross between a stupendous Blueberry clone from DJ Short and our own Il Diavolo, this is a first g..
A cross between our own Afghan Kush, a 100% indica strain which comes from kush strains grown in a s..
A 100% Sativa strain that grows wild to the north of the Drakensberg ridge, she flowers early, has a..
- Colombian Gold- Wild Thailand- Kilimanjaro- South Africa kwazulu..
Industrial Plant cannabis seeds by Dinafem Seeds belong to a feminized, Sativa/Indica cannabis strai.. Original Amnesia cannabis seeds by Dinafem Seeds belong to a feminized, Sativa-dominant cannabis str.. Introducing the combined efforts of two premier varieties of cannabis seeds and creating another mas..